Eight percent of the American adults who use the internet are Twitter users. It is an online activity that is particularly popular with young adults, minorities, and those who live in cities. Since August 2008, the Pew Research Center’s Internet & American Life Project has been asking a question in occasional national telephone surveys about services like Twitter. In the 10-year lifespan of the Pew Internet Project, we have not usually asked about single, company-specific online applications or activities because our mission is to look generally at online activities, rather than at specific brands. For instance, when we looked at teens and gaming, we focused on genres of computer and online games, rather than usage of particular games. In August 2008, 6% of internet users said “yes” to that question. In September 2010, 24% of internet users said “yes.” When we reported the findings at various points, much of the news coverage and public attention to those findings noted that the question – and the answers – covered more than just the Twitter-using population. But some analysts and readers clearly thought our figures simply stood for all Twitter users. As we saw that impression taking hold, and as it was becoming clear that Twitter users were emerging as an important research subject on their own, we decided to use question language that exclusively focuses on Twitter. We added a straightforward question to our tracking survey that took place in November 2010 where we asked online adults: “Do you use Twitter?” In this survey, 8% of online adults said they do use Twitter—with 2% doing so on a typical day. This survey also showed that 74% of American adults are internet users, meaning that the Twitter cohort amounts to 6% of the entire adult population. The table below shows the basic demographic breakdown of that population. 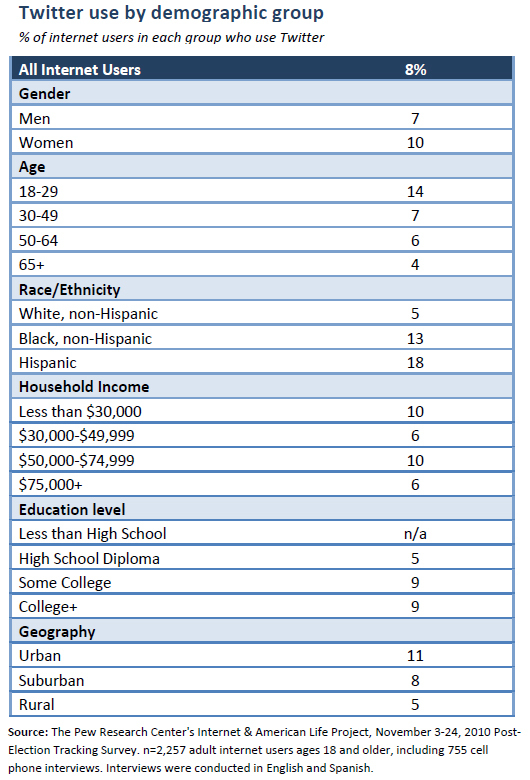 Young adults – Internet users ages 18-29 are significantly more likely to use Twitter than older adults. African-Americans and Latinos – Minority internet users are more than twice as likely to use Twitter as are white internet users. Urbanites – Urban residents are roughly twice as likely to use Twitter as rural dwellers. Women and the college-educated are also slightly more likely than average to use the service. In those omnibus surveys, we probed more deeply about how users engage with Twitter. There were 102 Twitter users in those surveys once we combined the datasets and the following material represents the findings from those Twitter users. We think that these findings provide a useful portrait of how Twitter users engage with the service. However, given the modest overall sample size these statistics are best understood as directional findings with a relatively large margin of error. In the follow-up questions on those October surveys, we found that Twitter users are nearly equally divided between those who check the site on a daily basis (or multiple times per day) and those who check the site infrequently or never. Just over one-third of Twitter users (36%) check for material posted by others on a daily basis or multiple times per day—this is roughly comparable to the two in five (41%) who say they check the site less than every few weeks, or never do so at all. The remaining one-quarter of users say they check the site for updates a few days each week or every few weeks. In addition to asking how often they check the site for updates about others, we also asked Twitter users how often (if ever) they use the site to post their own content. We asked about nine different types of content that Twitter users might post to the site, and found that Twitter users tend to comment on a relatively wide range of topics—the typical user posts four of the nine different types of tweets we asked about in our survey. 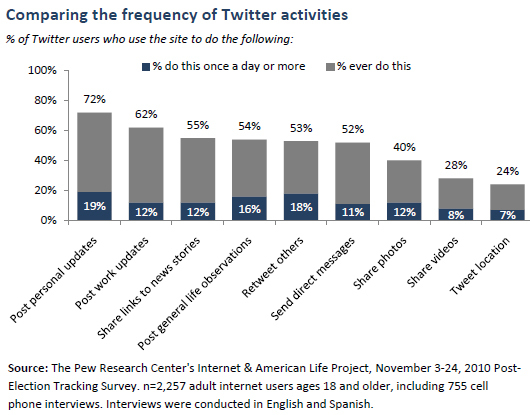 72% of Twitter users in our sample say that they post updates related to their personal life, activities or interests. 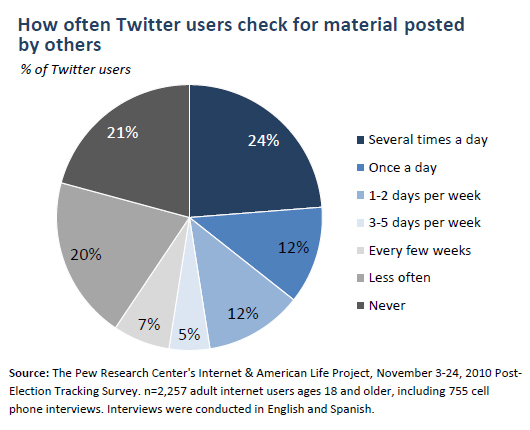 A total of one in five Twitter users (19%) say they post personal updates once a day or more. 55% of these Twitter users share links to news stories. One in ten (12%) do this at least once a day. 40% use Twitter to share photos with others, with 12% doing so at least once a day. 28% use Twitter to share videos with others. Fewer than one in ten Twitter users (8%) do this once a day or more.